Zainab’s travel experiences follow a clear pattern. She is unable to obtain or print out her boarding passes before arriving at the airport, so she has to wait an hour or more at the ticket counter while airline employees call a number in Washington to see if they can clear her to fly. 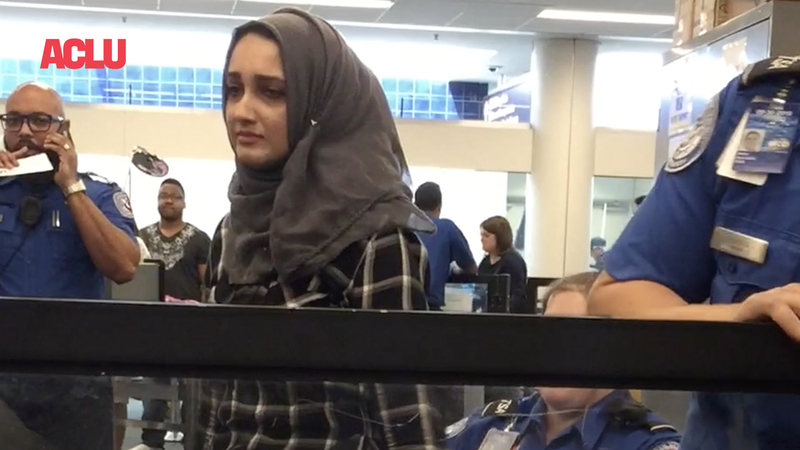 Transportation Security Administration screeners then run her through a gauntlet at security checkpoints — a process that can take another hour. Instead of a quick turn in a scanning machine, she must undergo thorough pat-down searches, during which TSA screeners place their hands all over her body, including private or sensitive areas. They remove and inspect all of the contents of her bags, in full view of other travelers passing through the checkpoint. When she finally arrives at the gate, TSA officers are waiting for her there and require her to undergo additional pat-down searches — even though she cleared security only minutes earlier — in front of the passengers who will travel with her on the flight. Reentering the country from abroad can be even worse. Zainab has had to wait six hours in the middle of the night in a cold customs inspection area with crying children and no access to food or phones. Despite First Amendment protections, she has been questioned about her religion or why she wrote a blog post criticizing U.S. Customs and Border Protection for racial and religious profiling — border officers even blatantly suggested that she refrain from criticizing CBP in the future. She has been subjected to unconstitutional searches of her laptop and smartphone, which included personal pictures of her without the headscarf she wears in public in accordance with her religious beliefs. The toll this has taken on Zainab has been severe. She avoids flying if possible because of the anxiety and humiliation she experiences when she does fly. She and her husband also avoid flying with their children, in order to spare them the awful experience of watching their parents demeaned and stigmatized by government agents. Faced with the prospect of undergoing the same invasive, duplicative screening protocol every time she flies, Zainab decided not to enroll in courses at Harvard during the fall of 2017. Compounding all of this is the knowledge that she has done nothing wrong and doesn’t know why the government is treating her this way — but she can’t get anyone inside the government to put an end to it. This pattern of harassment, intrusive searches, and detention during travel is likely the result of unfair blacklisting: being placed on a government terrorism watchlist. We have long criticized the federal government’s watchlisting system as a due process nightmare. The government uses vague criteria and a very low standard to place people on its master watchlist, which as of June 2016 had ballooned to about 1 million people. According to the government’s own watchlisting rules, “concrete facts are not necessary” to meet the standard for blacklisting, and uncorroborated information of doubtful reliability can suffice. That leaves the door wide open to relying on rumor, bias, or false statements. The consequences of blacklisting can be harsh and wide-ranging. Blacklisted individuals and their families have been subjected to harrowing displays of force and lengthy seizure at the border, surveillance and unjustified stops by domestic law enforcement, and detention and interrogation by authorities abroad. That’s to say nothing of the psychological and emotional damage that comes with constantly being stigmatized and demeaned as a suspected terrorist — an important but often ignored consequence of blacklisting. As with other national security-related policies in the post-9/11 era, available information indicates that these consequences are borne overwhelmingly by members of American Muslim, Arab, and South Asian communities. To top it all off, the government’s system of “redress” for people who are or may be blacklisted is completely inadequate. Under it, the government won’t even tell people if they’ve been blacklisted, let alone give the reasons why or a meaningful opportunity to clear their names and get off the list. After Zainab submitted a redress petition last year, DHS sent her a form letter stating that it “can neither confirm nor deny any information about you which may be within federal watchlists.” Since then, nothing has changed, and she continues to experience harassing searches and detention whenever she travels. Zainab’s terrible experience is yet another indication of the unfairness of the watchlisting system and the harms it inflicts on individual lives. We’re calling on DHS to stop singling Zainab out for this treatment, investigate the conduct of TSA and CBP officers, and turn over any relevant records. It’s the least that justice demands.